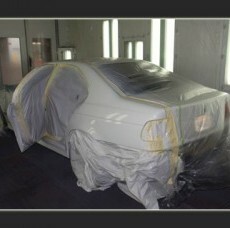 Why Choose SkillCraft For Auto Paint Repair? When it comes to auto paint repair, like all of our auto repair services, we pride ourselves on a job done right, the first time, every time. We are proud to offer a lifetime warranty on all of the work that we do at no extra charge. We strive to maintain the highest levels of customer satisfaction through open lines of communication. We utilize the most advanced training and technology available to turn your vehicle around quickly, without ever compromising the integrity of our work. High quality, professional, customer focused service done right is why we have we have been named as one of the top collision repair shops in America, and have been the winner of the Auto Club Outstanding Service Award for 4 consecutive years. We have been an I-Car Gold Class Shop for 15 years and a two-time winner of Verifacts’ ACE Award for Collision Excellence. We have served generations of Orange County residents since 1977, repairing tens of thousands of vehicles, and we have built an expansive knowledge base and level of expertise that can only come from experience. All of these are but some of the reasons why SkillCraft is Orange County’s choice for Auto Paint Repair. Finest Quality ENVIRONMENTALLY FRIENDLY BASF Paints Safer for the environment We use the 90-Line Waterborne Base coats by Glasurit. 90-Line Waterborne Base coat is the most advanced coating available in today’s market. It’s this superior technology that has convinced seventy percent of worldwide OEM car manufacturers to use waterborne base coat finishes – which means that it’s also your best choice when you have your car repaired. Visit www.glasuit.com 90-Line will provide you with the highest quality repair available, but by choosing Glasurit 90-Line you are also choosing to help keep the environment clean. “Green” products such as 90-Line Waterborne Basecoats emit far fewer VOCs (Volatile Organic Compounds) than their solvent borne counterparts. In fact, 90-Line meets the most stringent VOC regulations in the world, and lower VOC emissions will help to greatly improve air quality.